Brazilian President Dilma Rousseff’s first official visit to the United States this week has been marked by confrontation and disagreement. The purpose of the visit was to attempt to strengthen trade, investment and political ties between the two nations, but nothing substantial was agreed. 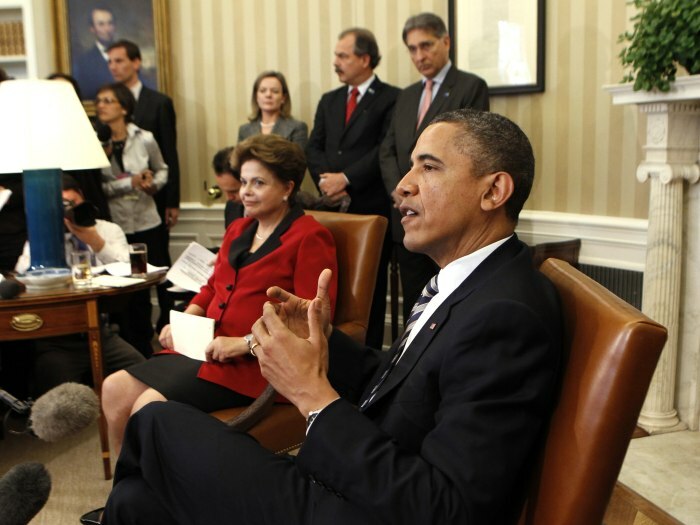 Obama praised Rousseff and Lula for the progress that they have made in Brazil, and especially for aleviating poverty. The meeting, however, was marked by Rousseff’s combative mood; she strongly criticised developed nations for the financial policies that she said were threatening growth amongst emerging nations. The biggest bone of contention for Brazil appears to be the fact that the US does not want to recognise Brazil as an merging world power. While Obama treated both Chinese and Indian leaders to a ‘state visit,’ which entails a formal banquet at the White House and the possibility to address Congress, Rousseff was on an ‘official visit,’ with less pomp and circumstance. The United States continues to be suspicious of the Brazilian government’s motives, and has been annoyed at Brazilian opposition to American international actions, most recently in Libya. Both leaders were mistaken in their approach to the meeting; Brazil clearly wants to rival the United States in the Americas, as well as on the world stage, but it is still a long way from achieving that. Although Brazil has gained headway in terms of diplomatic power, and is fast emerging as a regional leader, the US still dominates Latin America economically and militarily. If Brazil covets a greater international role then it would be best advised to cooperate closely with the US, and not appraoch bilateral meetings in a combative mood. The United States must recognise that Brazil is a rising power in the hemisphere, and if it is not yet a great power, it looks likely to be one in the near future. Failing to recognise that fact now could have important ramifications for the US position in the Americas in the near future.